Peterborough United winger Nathaniel Mendez-Laing is determined to prove he is more than an impact player from the bench in his second spell for the club. The 20-year-old made 40 appearances while on loan in 2010-11, but only 12 of them were starts. He rejoined the club from Wolves in July on a three-year deal and wants a regular place in the team. 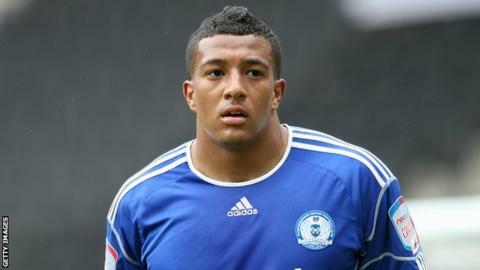 "I want to be playing every week, as much as possible," Mendez-Laing told BBC Radio Cambridgeshire. "I was still young last time, but now I've developed more as a player and hopefully it will be a big season for me." He could make a belated Championship debut at Burnley on Saturday after recovering from a thigh injury suffered in a pre-season game against Stevenage. Mendez-Laing had hoped to play against Birmingham at the start of the month but was advised by the club physio not to rush his comeback and risk further damage to the hamstring. "My game is getting it out wide and sprinting and you've got to look after it. "I've got certain exercises that I need to be doing in the morning and I've just got to keep on top of it and it should be all right," he said. Peterborough have yet to earn their first point, having lost their first four matches, but Mendez-Laing insisted morale was still good. "No-one's put their head down - everyone's still at it and ready to get us to where we need to be," he added.